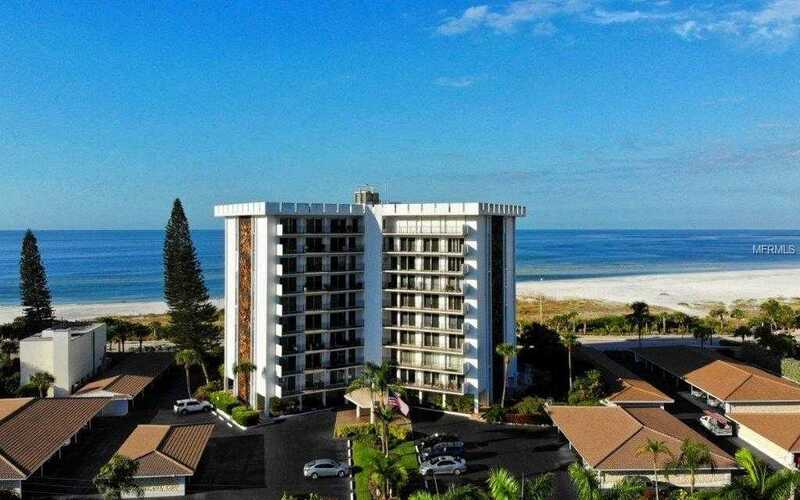 Located on Lido Key, this beautifully updated seventh floor condominium in St Armands Towers South has captivating views that overlook Sarasota Bay and the downtown city lights. Enjoy the tropical setting that 8217;s just a stone 8217;s throw away from Lido Beach and St. Armands Circle. Wake up each morning with a fresh perspective as you walk along the sand, head to the Circle for coffee and a croissant, and then embark on a day full of outdoor adventures or beachfront relaxation. The 2 bedroom residence incorporates open spaces pristine finishes and a light and bright aesthetic. A large 40 ft balcony expands the views from the living area and both bedrooms. The sparkling kitchen was recently updated with granite surfaces, stainless appliances, tile floor, raised panel cabinets. Entertain in the large living area or separate dining room. The master bedroom is spacious and serene with a large walk-in closet and sliding glass doors to the balcony. The guest bathroom shines with newly updated features including granite, mosaic tile, new vanities, fixtures, glass panel doors, and tile flooring. You 8217;ll appreciate a sound building envelope with electric hurricane shutters. St Armands Towers South offers newly updated community room with open kitchen and fitness center, onsite management, heated pool, and is pet friendly up to 25lbs. Live the Lido Key lifestyle with the beach, shopping, and dining destinations just a walk away. The renowned cultural experiences of Sarasota are just over the bridge! Restrictions: 1 pet, max weight 25 pounds, tenants may not have pets. Please, send me more information on this property: MLS# A4421097 – $599,900 – 101 Benjamin Franklin Dr #75, Sarasota, FL 34236. I would like to schedule a showing appointment for this property: MLS# A4421097 – $599,900 – 101 Benjamin Franklin Dr #75, Sarasota, FL 34236.